A Degree in Engineering or Technology in the concerned discipline for which applied, recognised by Board of Apprenticeship training. 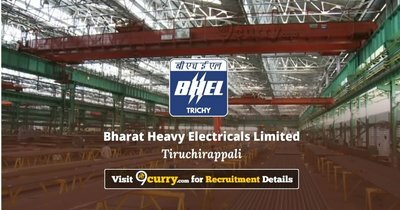 Eligible candidates may apply online at BHEL Trichy's website (direct link is given below) from 26 Oct 2018 to 05 Nov 2018. Candidates log on to https://www.bheltry.co.in/.